Anthony Claret was born on December 23, 1807, is Sallent, Spain, the fifth child of John Claret and Josephine Clara. Anthony’s vocation to the Priesthood became evident at a very tender age. However, the financial circumstances of the family made it necessary for him to spend his early youth helping his father in the weaver’s shop. When his help was no longer an absolute necessity in the home “the weaver’s son” entered the Seminary in Vich, and was raised in the Holy Priesthood on June, 13, 1835. The activities of the ministry in a small-town parish were unable to satisfy the yearnings of Claret’s great soul. He preached first in his own Diocese and later, at the invitation of the other Bishops, he covered all of Spain and the Canary Islands. He is also known to have many a time delivered as many as eight sermons in one day and often to have heard confessions for ten solid hours without interruption. Everywhere he went miracles of conversion were recorded and the faithful returned to a fervent militant practice of the Catholic Faith. People soon began to look to him not only for spiritual help but also for relief of their physical ills. When his personal efforts became insufficient for the task on hand he called on the assistance of other apostolic men and founded the Congregation of Missionary Sons of the Immaculate Heart of Mary (Claretian Fathers) on July 16, 1849. The Holy Father being well aware of Father Claret’s apostolic dynamism considered him the ideal Pastor for the very difficult vacant See of Santiago in Cuba and appointed him its Archbishop. He was consecrated on October 6, 1850, taking for his motto “The Charity of Christ urgeth us on,” adding the name of Mary to his own. The first official act of the new Archbishop was to consecrate his diocese to the Immaculate Heart of Mary. He then began the systematic reconstruction of the Diocese by personally conducting retreats for all the Clergy, and his missions for the faithful of the extensive and extremely difficult territory. He instituted a Seminary for native clergy and founded an order of teaching Sisters. He published a simple illustrated catechism and devised a system for teaching religion which was later approved by the Vatican Council for the entire Church. He established cooperative Farms, Parish Credit Unions, a Boys’ Town and Girls’ Town, and founded the first institute of “Religious in their homes” or what are now known as Secular Institutes. He fought the injustices of wealthy European land owners, going as high as Her Majesty’s government in Spain in his efforts to defend the rights of the working classes. Queen Isabella II, the reigning sovereign in Spain, became deeply interested in the work and philosophy of the saintly Archbishop of Santiago. Wishing to see the impact of his apostolate and the influence of his holiness felt throughout her entire Realm she prevailed on the Holy Father, Pope Pius IX, to appoint him her confessor and spiritual director of the Royal Household in 1857. It was during this period that the forces of irreligion unleashed their bitter attacks upon the Holy Archbishop and all he stood for. Every available means was used to discredit his name, and render him inactive. His enemies rested only when they had succeeded in having him banished from the country. And even then, their relentless persecution followed him into exile. From his exile in Paris, the Archbishop traveled to Rome for the Vatican Council, at which he took a very active part. While in Rome, the Archbishop suffered a severe stroke of apoplexy and was moved back to France. He went to his reward in the Cistercian Monastery of Fontifroid on October 24, 1870. 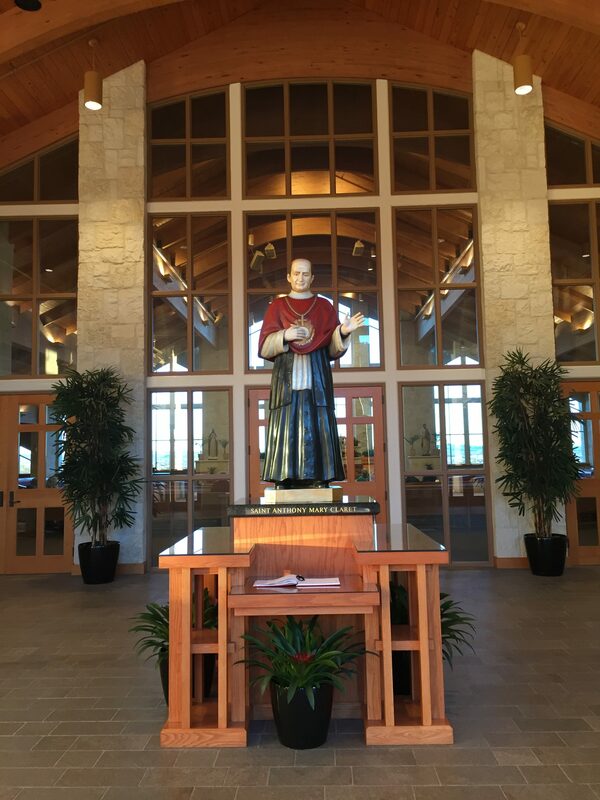 At the present time, devotion to Saint Anthony Mary Claret is rapidly spreading throughout the world, and especially here in America. Reports from all over the United States, Canada and Mexico attribute very recent and wonderful graces received through the intercession of our great Saint. Not a few of these have to do with sudden and unexplained recovery from cancer. Twice during his own lifetime, Saint Anthony was personally afflicted with malignancy and miraculously delivered from it through the intercession of the Blessed Virgin Mary.